A new study about actual users of the iPhone 8 and iPhone X shows that combined adoption of the two models during the first few days of use as a percentage of the total user base is higher than that of the iPhone 6s or 7 at the same time in rollout. 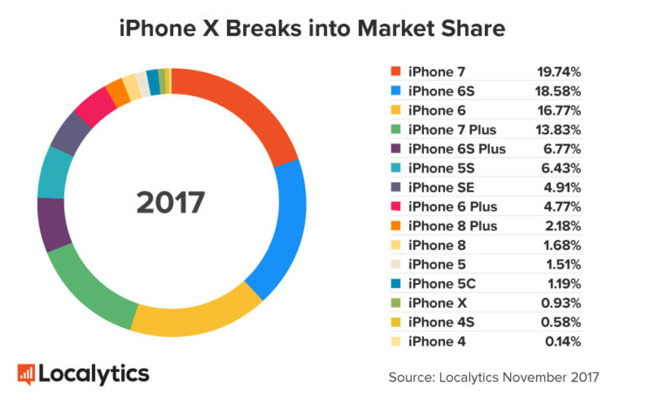 According to analytics firm Localytics, the iPhone X achieved 0.93 percent of the total iPhone user share after only a weekend of use. The iPhone 8 and iPhone 8 Plus garnered 0.7 percent, pushing the pair over 1.6 percent. For comparison, the iPhone 6s in 2015 captured 1 percent of the iPhone active user base, with the iPhone 6s Plus taking 0.3 percent. The iPhone 7 also seized 1 percent, with the tightly constrained iPhone 7 Plus seeing 0.2 percent of the active user base. In 2014, the iPhone 6 captured 2 percent, with the iPhone 6 Plus collecting 0.3 percent. What the percentages do not account for, and Localytics points out, is the growth in the iPhone user base over time. While the iPhone 6 saw the highest percentage of users in the first active week of use in 2014, there was a groundswell of users upgrading to the first larger form-factor iPhones produced —and a smaller amount of total users than there are now. Localytics expects that if Apple's predictions of a best-ever quarter are accurate, the iPhone X will grab more of the overall user base than previous models have. The research firm based the 2017 data on 70 million iOS devices globally. The iPhone X data collection period was Nov. 3 to Nov. 5.